Looking at the world at 40. « How many do you have? What I did when I forgot my book. I NEED my mental break at lunch. I prefer to read a book. It takes me away from the office and into another world. This is why I prefer to read Science Fiction or Fantasy novels as well. But I forgot my book yesterday and instead grabbed the book I had jus finished. I also forgot my breakfast and lunch in the fridge. At least I didn’t leave it on the counter. But I still needed to do SOMETHING at lunch. I hate being bored during that time. Being bored on company time is bad enough. Being bored on my own time is somehow worse. It’s a good thing I had two stitching projects with me. The down side is that I normally do something while stitching. Watch t.v. or a dvd or chat with people. Not an option in my cube. (I hate the lunch room.) So it was still a little tedious. I worked on this little dragon. Maybe I’ll finish it soon and can post a picture of it completed. I also need to update my Tardis Project. I have two items finished. In the stitching world there is something we call finished but not finished. 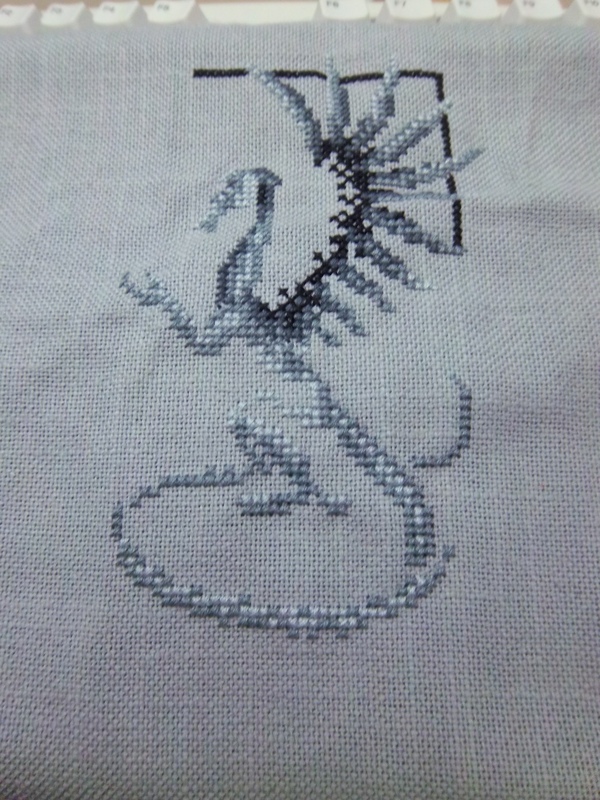 The stitching is done but it hasn’t been turned into anything yet. I also made a good bit of progress on my Elegant Pumpkins. I’m still having trouble tracking down two of the colors. Once I get those photographed, I’ll be posting that update. But in the meantime, here is a sample of the little dragon. The pattern is called Futurecast and it is by Teresa Wentzler. A lot of people hate Wentzler patterns because they tend to be ‘advanced’. They make massive use of blending two different colors and they use tons of partial cross stitches. This is a free pattern on her website. It is designed so the stitcher can easily alter the color scheme to whatever he or she wants. I’m not blending two colors for every symbol. I’m just using one. So there is a little less subtlety. I may do so if I stitch it again. It’s not too big and the ease of swapping colors makes it a great pattern for stitching gifts. It is a good introduction on how to change colors on patterns and the partial stitches are kept to a minimum so it is also a good introduction to Teresa Wentzler patterns in general. This entry was posted on June 1, 2012 at 8:59 am and is filed under Books, Food, Life with tags Advanced, Blending, Book, Books, Cross Stitch, Distraction, Dragon, Dragons, Forgetfulness, Get Away, Hobbies, Introduction, Lunch, Pumpkin, Pumpkins, Stitching, Tardis, Teresa Wentzler, update, Updates. You can follow any responses to this entry through the RSS 2.0 feed. You can leave a response, or trackback from your own site.